Examining Mathematics Practice through Classroom Artifacts helps teachers become more analytic about their students' thinking by showing them how to use student artifacts to evaluate what is happening in the classroom. 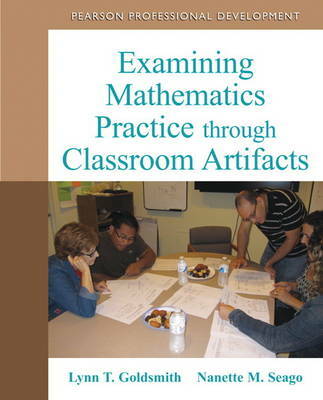 Offering an innovative framework, this book helps teachers learn how to use classroom artifacts to assess students' mathematical thinking and students' understanding of mathematical content. Focusing on elementary through middle grades, chapters investigate what classroom artifacts are, how to interpret them and ways to use these data to improve mathematics instruction. "The book takes a qualitative view of a quantitative subject, which is not easy to do successfully. The discussion on the strengths of using habits of mind as a basis for lesson plan evaluation was very strong. I would use that idea as the basis for PD in my own school district." "[This book] examined and delineated the thinking that needs to occur to develop mathematically strong instruction and to improve our analysis of students' thinking. It shifted our attention from errors as merely mistakes, to errors that help us to identify strengths as well as weaknesses. How to interpret student thinking based on artifacts from the classroom, how to identify the mathematical "big ideas" in curriculum, how to ensure the rigor of our lessons, and how students represent their mathematical thinking as well as using errors to develop next steps are the key ideas of this manuscript. All of these topics are critical components of quality instruction."